I hope you all enjoyed your Easter weekend. We stayed at home but really enjoyed having an extra couple of days. I made some Easter decorations, based on an idea I saw on Sew for Soul Blog, although I used tissue paper painted with acrylic as my base layer. It was a little fiddly to cut the images out of the paper napkins, but I am pleased with the way they turned out. I also decorated some others with pastel dots and tissue paper stars, but they aren't quite finished yet. 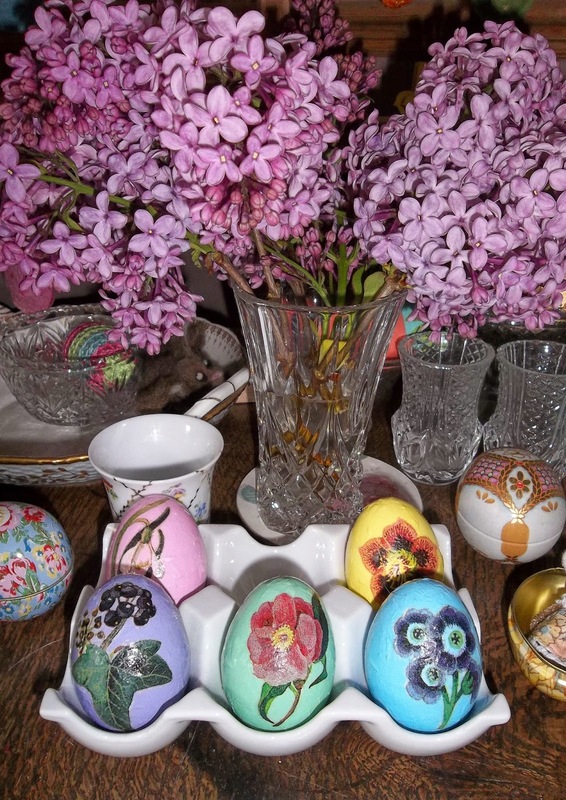 The lilac in the top picture had to be cut from the tree as it was a wayward branch which threatened to hit us every time we went near it, but it is scenting the room nicely and adds a bit more Spring to the Easter decorations. Lilac is not the most beautiful of trees for most of the year, but then it really does earn its place for three glorious weeks in Spring. Thanks, Josie. It was a lovely tutorial of yours and thank you for posting it. I am really pleased with how they have turned out. Thanks, Wendy. I wish they were - it would be so nice to be that talented! So glad you also had nice weather! Thanks, Mirjam. We had some lovely bright blue sky and sunshine which was much appreciated. The eggs have worked out really well and I have enjoyed making them. I really love your little Easter eggs. So sweet!! 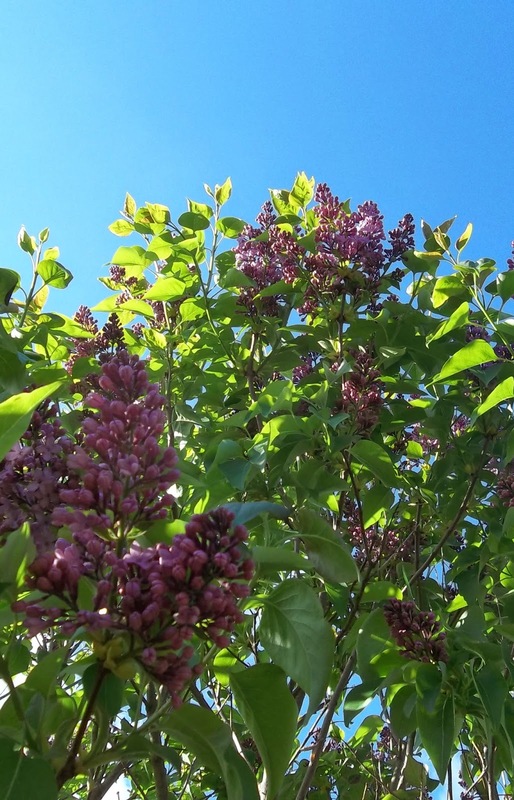 That Lilac tree is just gorgeous! I sure do wish they bloomed all year round. I am new to your blog and am your newest follower. Hello and a Huge welcome! The eggs worked out really well and I must get the others finished too. They are polystyrene underneath so are really light (just in case one of the cats decides to knock them off the table!) . Our lilac tree used to be really big but the main trunk rotted and blew over a year or two ago. However, branches grew back and this is the result now (it's a much better shape too). We love seeing (and smelling) the flowers. I hope you'll enjoy looking at my blog. Thanks, Joy. 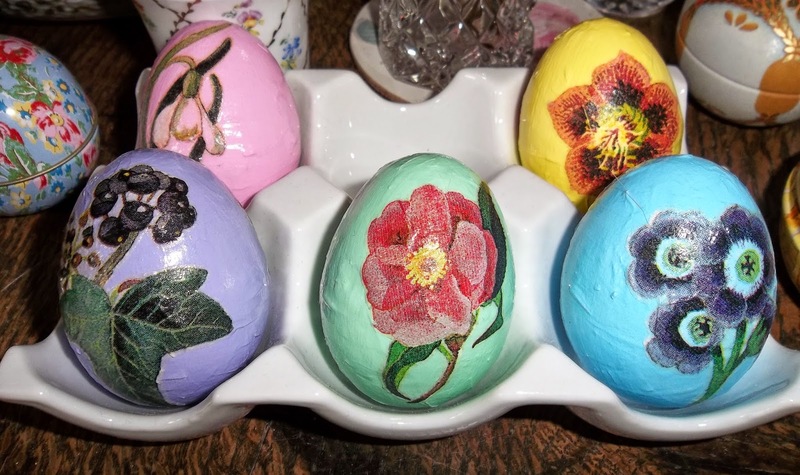 It was a lovely idea from Josie's Blog and I just thought they would make a nice addition to the Easter display. 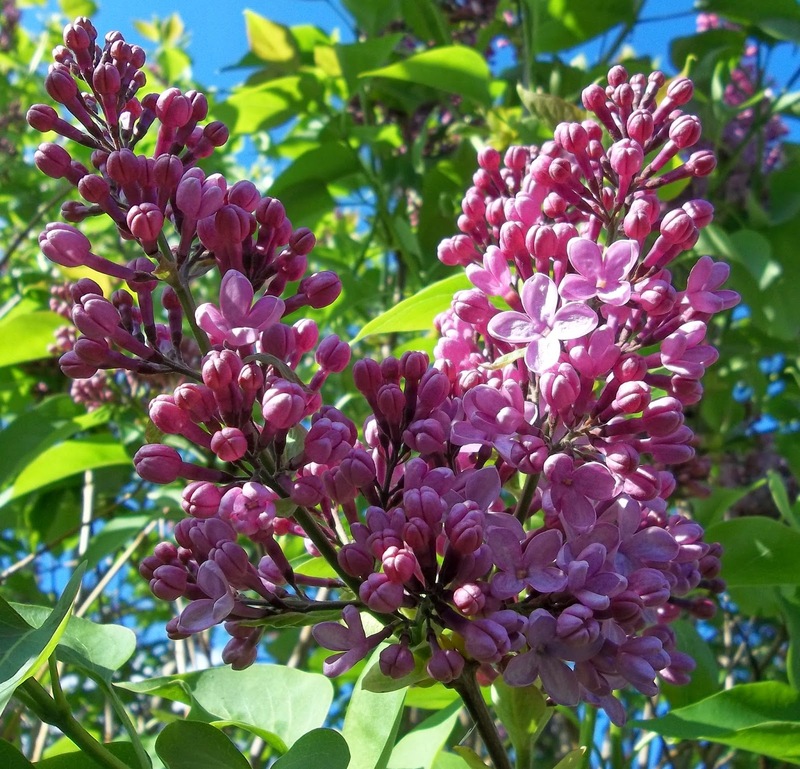 The lilac is beautiful at the moment and I'm so pleased that the photos brought back happy memories for you.